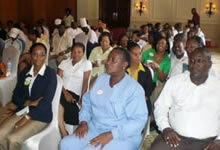 (Above): (Left) Donna-Jean, Training Manager, Grand Pineapple, Antigua. (Centre) Dale from the Grand Pineapple receives his ML3 certificate. (Right) Sherene, Training Manager, Sandals Antigua, with Samer. 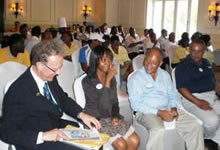 Profiles the graduation event held in the William Jefferson Clinton ballroom, Sandals Grande St Lucian Resort & Spa and at the Grand Pineapple Resort, Antigua, following briefing and review meetings held at Sandals Grande, Sandals Regency and Sandals Halcyon Resorts, Saint Lucia and the Grand Pineapple and Sandals Grande Resorts, Antigua.